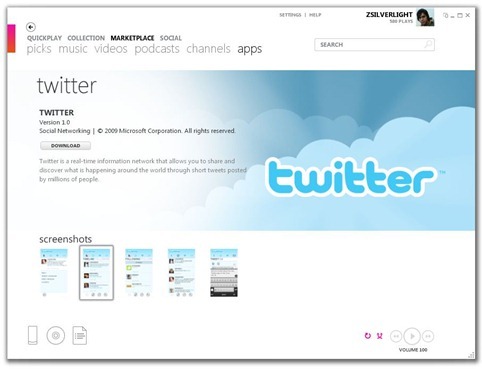 Microsoft today has announced the availability of Twitter app for the Zune HD portable media player. Zune HD 4.3 firmware was released last month which added support for running 3D games and apps on the Tegra-powered Zune HD. The first batch of these games and apps finally arrived last month as a free download via the Zune Marketplace. And today the much awaited Twitter app for the Zune HD has finally arrived. You can download the Twitter app for Zune HD for free from the Zune Marketplace on the device, or directly from the desktop client software on your Windows PC. Zune HD 4.3 firmware on the device is a requirement for all the apps. Make sure you have updated to the latest firmware version (v4.3) before you try and install the app. Facebook app for Zune HD is in the pipeline too. We’ll let you know whenever it is available for download. You can follow us on twitter or join our facebook fanpage to keep yourself updated on all the latest Zune releases.